The world’s top 18-and-under female junior golfers will head to Ottawa for the fifth edition of the World Junior Girls Championship from Sept. 11-14 at Camelot Golf and Country Club. As host nation, Canada will send two teams of three athletes to compete for the international title of World Junior Girls champion. Representing Canada One will be Céleste Dao (Notre-Dame Ile Perrot, Que. ), Ellie Szeryk (London, Ont.) and Tiffany Kong (Vancouver, B.C. 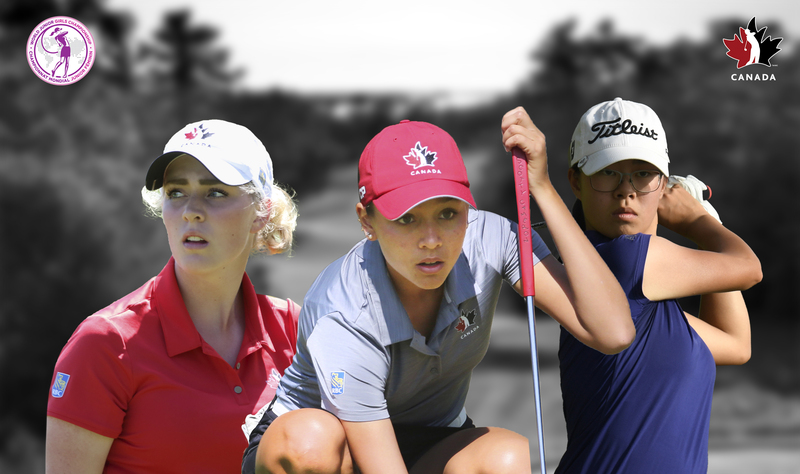 ), who are three of Canada’s top-ranked junior golfers at No. 317, 459 and 546, respectively, on the World Amateur Golf Rankings (WAGR). All three recently competed in the 2018 CP Women’s Open at the Wascana Country Club in Regina, Sask. This will be 17-year-old Dao’s third year representing Canada at the World Junior Girls. The Team Canada Development Squad rookie is having an extremely impressive season, adding to an already notable junior golf career. So far in 2018, she has recorded four victories – the Canadian Junior Girls Championship, Girls’ Provincial Junior Championship, U.S Women’s Open Qualifying – Cape Cod National and Mexican Junior Girls Championship – to lead the Junior Girls Order of Merit for the second consecutive year. Szeryk, sister of Canada’s top-ranked amateur female golfer Maddie, has four top-five finishes in 2018 so far, including a win at the Ontario Women’s Amateur Championship. The 16-year-old Team Canada Development Squad rookie currently sits in third in the Junior Girls Order of Merit and will be competing in her second World Junior Girls. Kong will also be competing in her second World Junior Girls – she represented Canada at the 2015 tournament hosted at The Marshes. The 17-year-old recently competed in the 2018 CP Women’s Open after qualifying as the Canadian Women’s Amateur Championship’s low Canadian. With a win at the Ryan Moore Junior Championship and four top-ten finishes in 2018 under her belt, she currently sits fourth in the Junior Girls Order of Merit. As the host country, Canada reserves the right to field two teams in the 63-player, 20-country competition. Canada Two will consist of Emily Zhu (Richmond Hill, Ont. ), Sarah Beqaj (Toronto, Ont.) and Lauren Kim (Surrey, B.C. ), who are ranked 1127, 1013 and 1066 respectively. 14-year-old Zhu is currently second in the Junior Girls Order of Merit. She has six top-ten finishes this year and competed in the 2018 Canadian Junior Girls Championship, where she came in second and took home the juvenile title. Her last win came at the 2018 Golf Ontario Investors Group Junior Spring Classic in May. Beqaj, 16, has top-ten finishes in three of the four events she competed in so far this year. Her best finish in 2018 was third at Golf Ontario’s Investors Group Junior Girls Championship, followed by her fifth place finish at the Canadian Junior Girls Championship. She currently sits twelfth on the Junior Girls Order of Merit. Kim is the youngest of all the Canadian team members – she only recently turning 13 in August. The rookie junior golfer held the lead during the first round of the Canadian Junior Girls Championship before finishing the tournament in eleventh. She won her first event in 2017 at the MJT – Boston Pizza National Championship and has five other-top ten finishes, including second place at MJT – Odlum Brown Classic and a tie for fifth at the Future Links, driven by Acura Pacific Championship. Matt Wilson (Golf Canada’s Women’s Development Squad Coach and Director of Next Generation Performance) will lead the two Team Canada squads for this competition with the support Reggie Millage (Golf Ontario Head Coach). Opening ceremonies for the championship take place on Sept. 10 followed by the first round on Tuesday, Sept. 11. The tournament’s closing ceremonies will immediately follow the conclusion of play on Friday, Sept. 14.